Adorable, like new tastefully appointed, low maintenance ranch style condominium situated on a level quiet corner cul-de-sac lot in a established newer subdivision with it's own neighborhood park surrounded by picturesque mountains and only a half block away from Rattlesnake Elementary School. This beautiful energy efficient 4 bedroom, 2 bath 1,800 sq ft condo with central air conditioning is the wonderful home boasting an ample open functional main level living floor plan with tall vaulted ceilings, a full finished lower level and large attached 2 car garage.Open spacious main level living & dining areas greet you and offer an abundance of natural light, adjacent to the well appointed functional kitchen with pull up raised breakfast bar, pantry, full complement of matching appliances, with ample counter space and wood stained cabinetry. The comfortable main level master suite boasts a walk-in closet and a direct access full bath with tub-shower combo. Central conveniently located well-lit laundry room with overhead cabinetry storage offers direct access to the insulated sheet-rocked attached 2 car garage. The comfortable finished lower level of the home greets you with an open family room area perfect for gatherings and central to the 3 large legal bedrooms and additional full bath. Low maintenance exterior of this condo features a welcoming covered front porch, vinyl privacy fenced mature rear yard serviced by underground sprinklers, brand new architectural shingled roof, and a private courtyard concrete sun patio ready for entertaining, barbecuing or simply enjoying the beautiful outdoors. Home Owners Association Dues include: The master Insurance Policy, Legal & Administrative Fees, Maintenance and Snow Removal off the street; Driveways & sidewalks, and repair of these items if needed. Lawn Mowing, Lawn care, Tree Maintenance of the units and common areas as well as the underground sprinklers watering maintenance of the system and Well, all for a low fee of $122 per month. 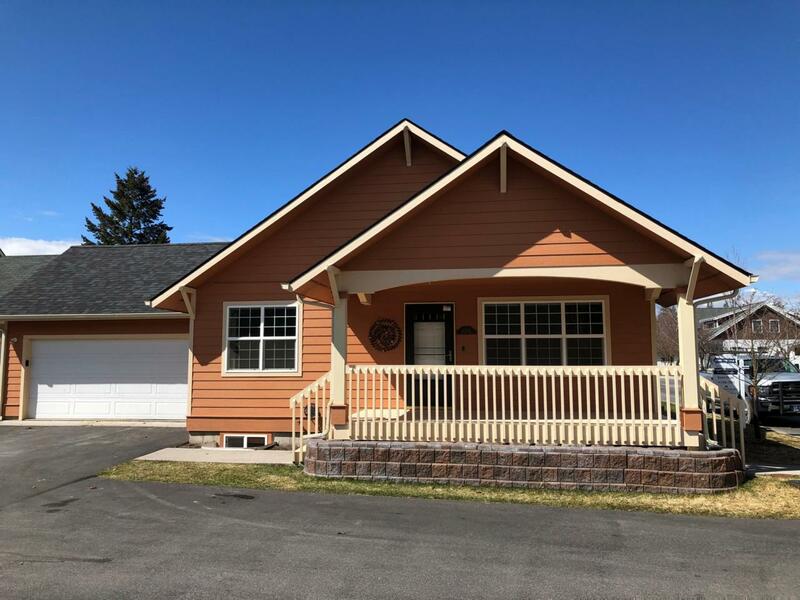 Around the corner is a mature level park with immaculate mountain views in the heart of the renowned rattlesnake neighborhood close to trailheads, hiking, biking and the many parks nearby. To view this fine home, please call Kent Pratt at 406-544-7001 or your real estate professional. Listing provided courtesy of Kent Pratt of Windermere R E Missoula.